BUCYRUS — Galion’s Lady Tigers captured the team title at Saturday’s annual Bucyrus Elks Invitational. Galion finished with 105 points. Ontario was second with 90.6 points, followed by 3. River Valley- 73; 4. Oak Harbor- 63.6; 5. Lexington- 60; 6. Upper Sandusky- 47.6; 7. COLONEL CRAWFORD- 41; 8. Mohawk- 39; 9. Western Reserve- 35; 10. Crestview- 31; 11. Harding- 25.6; 12. Bucyrus- 21; 13. Wynford- 16; 14. South Central- 7.6; 15. Ridgedale- 5 and 16. Plymouth- 2. The Crestline Lady Bulldogs were also in action in Bucyrus, but would not score any points as a team. In total, the Galion Lady Tigers claimed four individual event titles and a relay title. Samantha Comer and Marisa Gwinner each won two events. Comer, a freshman, won the 100-meter hurdles with a time of 16.69 and the 300-hurdles in a blistering 52.20. Gwinner aced her field events, taking the crown in the high jump by clearing 5-feet, 2-inches and over in the long jump, leaping 15 feet, 5¾ inches. The championship 4×100-meter relay team from Galion blew past the field en route to a title with a finishing time of 53.59. That team consisted of Gwinner, Comer, Kerrigan Myers and Jalyn Oswald. Myers would earn a pair of third place finishes in the 100-hurdles and 100-meter dash on the day, as well as a tie for second in the high jump. Oswald finished third for the Lady Tigers in the long jump. Other Galion placements on the girls side Saturday were: Sari Conner- 8th, 400-meter run; Brooklyn Cosey- 3rd, 300-hurdles; 4×400-meter relay team- 7th; Bri Streib- 2nd, discus and 3rd, shot put; Anna Court- 8th, discus and Mia Brannon- 3rd, pole vault. Colonel Crawford’s girls team placements were: 4×800-meter relay team- 7th; Cassidy Vogt- 4th, 100-hurdles; Reegyn Goyer- 2nd, 100-dash and 7th, 200-meter dash; 4×100-relay team- 5th; Ally Hocker- 3rd, 3200-meter run; Jillianne Gregg- 7th, discus; Drew Krassow- 2nd, high jump; Pierce Krassow- 7th, shot put and Sarah Campbell- 6th, pole vault. On the boys side of the invitational, it was the Crestview Cougars taking the title, scoring 106 points to edge runner-up Colonel Crawford with 90 points. The rest of the field included: 3. Oak Harbor- 76.5; 4. River Valley- 64; 5. Ontario- 54.5; 6. Lexington- 53.5; 7. GALION- 44; 8. Upper Sandusky- 43; 9. Wynford- 38; 10. Harding- 28.5; 11. Bucyrus- 21; 12. Western Reserve- 15; 13. Mohawk- 12; 14. Plymouth- 7; 14. CRESTLINE- 7 and 16. Ridgedale- 2. Colonel Crawford would take the top spot in two individual events and one relay event on the day in the crowded field. Distance runner Chad Johnson won both the 1600-meter run and the 3,200-meter run on Saturday. Johnson ran his 1,600, which he owns the event record in, in a time of 4:25.10 and the 3200 in 10:02.37. Chad also owns the 3200 record for the Elks Invitational. Johnson’s teammate, Wade Hopkins finished fifth overall in the 1,600 and fourth in the 3,200. The 4×200-meter relay team consisting of Colton Rowland, Kaleb Landin, Brody Martin and Harley Shaum won the boys title in the event in a time of 1:36.55, outlasting runner-up Oak Harbor, who finished in a time of 1:37.21. Other Eagles placing on the day were: 4×100-relay team- 3rd; 4×800-meter relay team- 2nd; 4×400-meter relay team- 5th; Drake Delong- 2nd, discus and 8th, shot put; Shaum- 3rd, high jump; Martin- 6th, 400-meter dash; Cody Reed- 8th, 400-meter; Alex Mutchler- 8th, pole vault; Rowland- 3rd, 200-meter dash and Braxton James- 3rd, 800-meter run. Takoda Crisman was the lone champion on the day for the Galion Tigers boys team. Crisman sprinted his way to first place in the 200-meter dash with a time of 23.74 to defeat speedster Alizhah Watson of Wynford (24.12). Crisman would also earn fourth place in the long jump on the day for the Tigers. Other placements for the Galion boys at the Elks were: 4×800-relay team- 6th; 4×100-relay team- 7th; Braxton Tate- 2nd, 3200 and 3rd, 1600; Gage Lackey- 5th, high jump; Ben Alstadt- 5th, pole vault and Noah Atkinson- 7th, discus. Crestline would earn their seven team points thanks to Max Anatra and Alec Sipes. Anatra took fifth in the 110-meter hurdles and eighth in the 300-meter hurdles while Sipes snagged seventh overall in the boys pole vault. Colonel Crawford’s Chad Johnson took home a pair of Bucyrus Elks Invitational titles on Saturday, March 31. 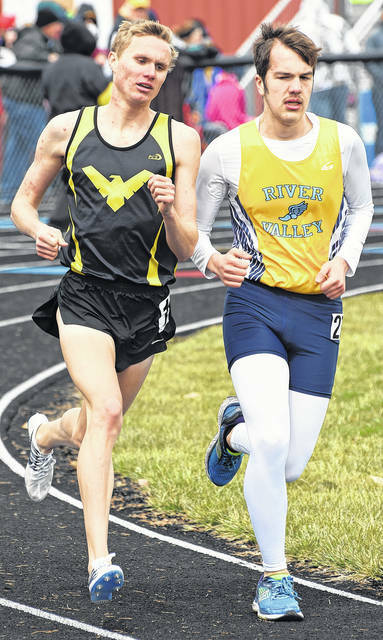 Johnson cruised past the field in both the 1600 and 3200-meter runs as the Eagles boys team finished as the runner-up overall. Galion’s Samantha Comer leads the pack during the 100-meter hurdles event on Saturday, March 31 at the Bucyrus Elks Invitational. Comer would win the race and teammate Kerrigan Myers would finish third. Colonel Crawford’s Cassidy Vogt earned five points by finishing in fourth place. Bri Streib was focused on the task at hand on Saturday during the Bucyrus Elks Invitational. The concentration paid off as Streib, part of the girls championship team, earned runner-up status with a toss of 108’5″.